Maitake mushrooms (Grifola fondosa) are prized for their rich, woodsy flavor and meaty texture. They are also called Hen of the Woods because their feathery rosettes resemble the ruffled plumage on a speckled hen. They are popular as an ingredient in stir-fries, soups, and stews or they can be eaten raw as a snack or in salads. They are also used to make tonics, teas, and herbal extracts that are reputed to have powerful healing properties. Maitakes have been used by practitioners of Asian medicine for thousands of years to promote health and longevity. Maitakes are native to the mountain forests of Northeastern Japan. They are now being cultivated, making them reliably available and less expensive. I can buy them in the fresh produce section of my local grocery stores year round. Healthful fries? This may be as close as we can get. Preheat fat or oil in deep fryer to 350 degrees F. Preheat oven to low. Place a rack in a pan and keep nearby to drain mushrooms. Rinse mushrooms, drain, and blot dry. 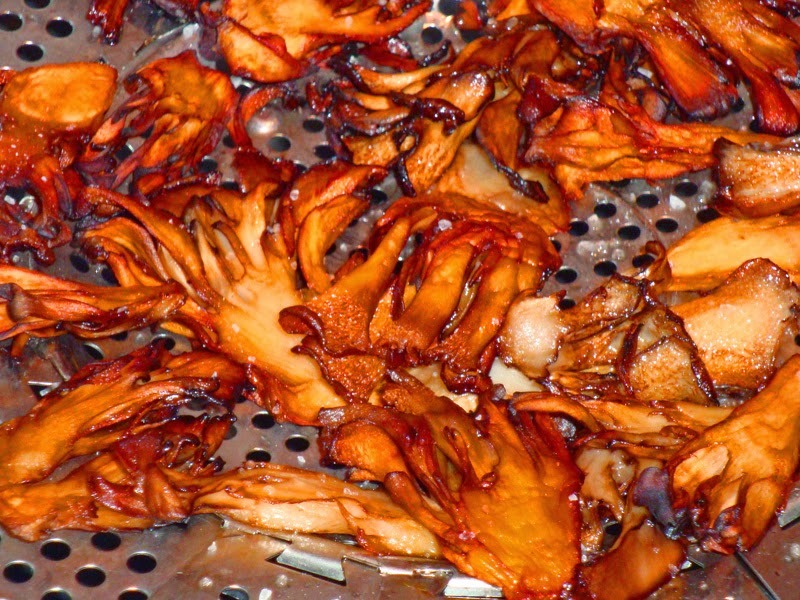 Separate mushroom clusters into individual fans. Slice thicker pieces and stems so they are similar in thickness. 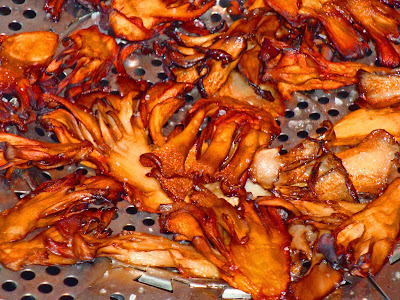 Add mushrooms in small batches to hot fat and fry for 15 to 20 seconds until crisp. Dip out with a spider and drain on rack. Place pan with rack and fried mushrooms in warm oven until all are done. Sprinkle with salt and pepper to taste and serve. Nutrition data for 2 ounces raw weight. ~Maitakes will keep refrigerated for about a week. For longer storage, clean, slice, spread on a tray, and freeze. When frozen solid, place in a plastic bag to use later. ~If you have never eaten maitakes, eat only a small amount at first, as allergies have been reported. Maitake Mushroom image at top from Wikipedia. Maitake Mushrooms, Starchy Side Substitute. Bookmark.